A missed serve here, an unforced hitting error there. It's the little things that often add up in a big way in the sport of volleyball. Hawaii knows that all too well, especially when it comes to a deciding Game 5. The 15th-ranked Warriors are 1-2 in matches that have gone to a fifth game and, had a few points gone the other way, they could be 5-4 overall instead of 3-6 -- and 3-3 instead of 2-4 in the Mountain Pacific Sports Federation. Hawaii has two chances to avenge its first five-game loss when it hosts No. 4 UCLA tomorrow and Friday. Some five weeks ago, the Bruins outlasted the Warriors 24-30, 30-28, 24-30, 30-22, 15-11 in the Outrigger Hotels Invitational finale. "I've tried to forget that game," Warriors senior Jake Schkud said of the defeat on Jan. 5. "We're a different team now. I think our serving and passing has gotten a lot better. "Right now, it's not about beating UCLA. It's about us needing a win. And UCLA happens to be in our path first." 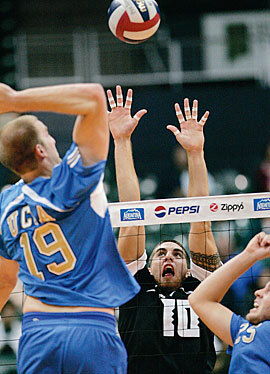 Hawaii Keali'i Frank tried to block UCLA's Jamie Diefenbach in the Bruins' win over Hawaii in January. This urban legend has a ring of truth to it. A question on a high school current events quiz reportedly once asked: "What does U.C.L.A. stand for?" The creative, albeit incorrect, answer given was: "Basketball." This occurred during the John Wooden era, when the Bruins won 10 NCAA basketball championships in 12 years, including seven in a row. Ask the question now and the answer might be: "Volleyball." Under Al Scates, the Bruins have won 19 titles since 1970 and, until the loss to Pepperdine in the 2005 NCAA final, every volleyball senior class at UCLA left with at least one championship ring. This year's edition is back in town for the second time in as many months to face Hawaii. In the 67th meeting between the two on Jan. 5, UCLA prevailed in five, 24-30, 30-28, 24-30, 30-22, 15-11 in the finale of the Outrigger Hotels Invitational. There's plenty of incentive for the Warriors (3-6, 2-4 Mountain Pacific Sports Federation) this week when trying to snap a four-match losing skid against the Bruins (9-4, 7-3). Hawaii has two swings at it in MPSF matches tomorrow and Friday at the Stan Sheriff Center. "There's a lot of incentive for the California boys (on the team)," said sophomore middle Steven Grgas, who is from Seal Beach. "UCLA was one of my top choices to play and now I want to beat them. "Some of my best friends are Bruins, including backup setter Cooper O'Connor. But UCLA is UCLA. They have all those titles and you don't want to help them get another." Hawaii has had its struggles since last seeing UCLA, going 2-4, all in MPSF play. The Bruins have fared better, chalking up a 7-3 record marked by some highs -- twice defeating Pepperdine -- and some real lows -- losing twice to rival USC for the first time in 17 years. The Warriors continue to tinker with their lineup and have implemented a new passing rotation in the past few weeks. The question mark at setter has likely been answered -- if last week's alumni match is any indication -- with junior Sean Carney expected to start tomorrow. "We're still a work in progress," assistant coach Mason Kuo said. "We have a bunch of guys who can fill in at different spots but it's all about chemistry." "I think where we've improved most is team unity," Grgas added. "Our passing is stronger, our hitting is more reliable, and we're blocking better." Hawaii (3.52 bpg) is second in the MPSF in blocking behind Long Beach State (3.81 bpg). The Warriors also led the conference in digs (11.88 dpg). Note: The Valentine's Day promotion tomorrow is "Bring A Date" with 2-for-1 ticket prices ... Friday is "Military Night" with 2-for-1 tickets available to active, reserve and retired member of the military with valid identification.